Can be enjoyed in store or picked up. Good for 1-5 people. If picking up, please call ahead. Varies per Request. House Trays Starting @ $12 Just Cheese. Charcuterie + $3. For parties of 5 or more. We ask 24 hrs. for prep. Various plating options. No 2 trays are ever the same unless requested. In store consultations preferred. Min. of $36. 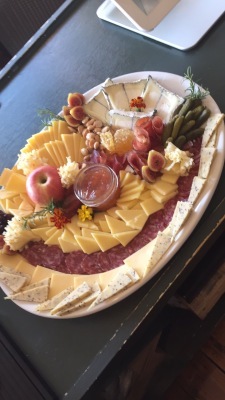 $8 -Just cheese $10 - Cheese & Charcuterie, prices per person. Or name your price. Prices include crackers, dried fruit & nuts. Pricing & Availability Upon Request. We ask you come by the store for a "Cheese Presentation Consultation". Let's create something unique. Affordable to Crazy Expensive. All about the customer. And when in Charlottesville, Va be sure to visit our sister store, Tilman's! Opened November 2017!